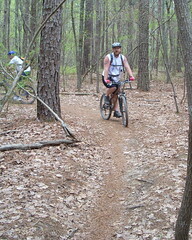 Biking at Harris Lake Park - To grrr, or not to grrr? That is the question. Got out to Harris Lake Park with swindunbar for some excellent riding. The parking lot was packed today with a skills clinic in progress, but hardly anyone was on the trail. It was cloudy, but with a nice warm breeze from the south and temps in the 70's, it was perfect. Trail was definitely a bit softer than it has been in the past with the recent rains we've had. Only issues were a big fall by Swin, but he recovered. Honest, he insisted that I take pictures! Fortunately we got out of there just in time before the rain came through and it poured for a little while. 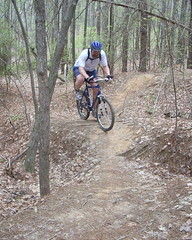 Was very happy the trails were able to dry out to enjoy some weekend mountain biking fun. See! 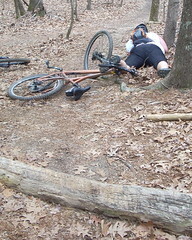 That is why I believe that all off-road bike trails need to be cleared, leveled and paved!! This is why people alway look around when they fall to see if anyone saw them; and then, if anyone did, they tackle the guy with the camera.